Want to keep your loyal and potential customers engaged and updated with your latest offers? Want to establish a personal connect with each of them with tailor-made content? Email/SMS Marketing is here to achieve just this and more for you. We have been working as a top rated bulk email service provider in India and bulk SMS company in Noida since over 16 years now. Our experience in the industry makes us a preferred choice for segmented, targeted and personalized mailers as well as for SMS marketing for your company. Segmented emails and SMS services help us reach difference audience sets on the basis of their search history and preferences. This data is pulled out with the help of tracking mechanisms that our team places at every stage to understand what exactly each buyer or buyer set is interested in. As a result, only relevant content shows up in each individual’s mailbox or messenger, thus providing better ROI. Once we have identified the areas of interest for your audience, a standard template (keeping in mind industry standards) is built for each promotional activity and the best online solutions are used to send out the emails/SMS in bulk. Various sections of the template are dynamic and the campaign is set in such a way that the dynamic fields directly pick up information about your consumers from our data sets. This is the basis on which communications are triggered and it plays a key role in sending custom-made emails/SMS, resulting in better open rates and CTRs eventually boosting sales. As a responsible and preferred Email and SMS Marketing company in Delhi NCR, we complete the loop for you and manage campaigns end-to-end. From identifying the needs and occasions on which we can send such marketing communications to creating the campaign and finally to tracking the granularities, we have got you covered. Some metrics that we track are open rates, traffic to website from the emails/SMS, campaign wise traffic inflow, which part of the template was most clicked on and conversion rate, among others. Our team of highly skilled UX designers and content writers work together on the insights to create engaging templates which are user friendly, appealing and in-line with your brand ideology. So while some communications are triggered automatically on the basis of events/actions by the consumers on your website/on the internet, we also invest a lot of thought in doing proactive communications. These include festivals, sales, special promotions, product launches and the like. 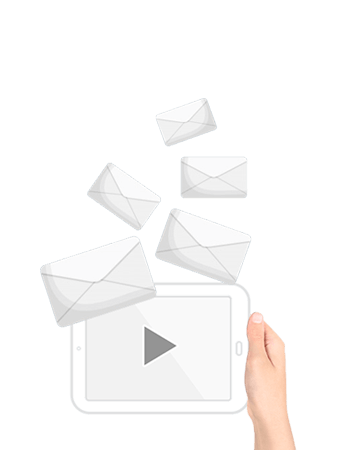 Achieve your marketing goals with scalable, personalized email and sms marketing.